Choose an appointment window for our service technician to arrive at your home and we will call you when he or she is on the way. You’ll never be stuck waiting for some HVAC contractor to show up sometime between 8 and 5, only to find out he can’t make it until the next day. If we arrive one-minute late, your repair is FREE. If we arrive 5-minutes early, but you think we were late, your repair is free. We’re always on time, or you don’t pay a dime. 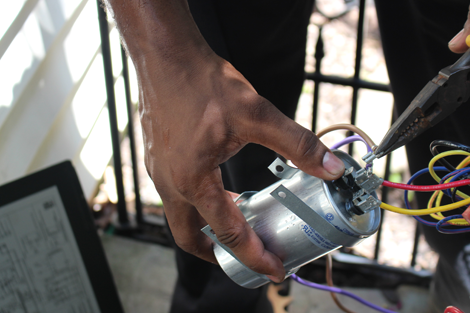 We start with a thorough evaluation, meaning we check and test all of the components of the system (including indoor and outdoor units). Whether you’ve got an air conditioner, furnace, air handler, or heat pump, our extensive training means we’ll find exactly what’s wrong. Once we have pinpointed the source of the problem, our technician will share that diagnosis with you along with any options for repair and answer any questions you have. All of our prices are listed on our StraightForward Pricing® Guide for you to look over. You choose the best option for your home and budget before we begin making repairs. Every yellow One Hour van is stocked with specialty materials so that our service technician can fix your problem on the first visit (and you don’t have to worry about being nickel and dimed when it comes to the cost of air conditioner or furnace parts.) We wear clean yellow floor savers and lay down drop cloths to keep your house just as clean as we found it. When your repair is done, it’s covered by our Total Satisfaction Guarantee. If you’re not satisfied for any reason, you don’t pay. We don’t curse, swear, smoke or use tobacco products on your property. Ever. Our team members are drug screened and background checked to ensure we can be trusted in your home. We guarantee to respect your home and family. You’ll never pay extra for after hours, weekend or holiday service. We’re fully staffed from 7am to 11pm and have technicians ready to roll 24/7. Fill out the appointment form below or call 757-868-7600 to feel comfortable in your home again. your system running at the peak of its performance.